Well, now that it’s officially summer, I want to eat ALL THE GRILLED THINGS. I’ve been using the grill on an almost-daily basis these past couple weeks, and I gotta say, I really missed it. Burgers, hot dogs, chicken, steaks, loads of veggies, and my absolute favorite grilled item of all time: BREAD. Yup, it’s back, friends. You may remember that I’ve had a serious love affair with grilled bread for a few summers now. And it’s back with a vengeance this summer already! When we re-did our kitchen a couple years ago, I was very pregnant and couldn’t cook anything at home for about a month (bad planning on our part), and so, I turned to the grill! I figured out how to make everything on that thing. Even cookies! It was a necessary evil that we came to love and appreciate more than we ever had before. It forced me out of my comfort zone and challenged my creative zones. Because when an eight-months-pregnant lady needs a cookie and has no access to an oven, you better believe she’s gonna get creative. I’ve also have a thing with whipped cheese. I’ve made more batches of my basic whipped feta more times than I can count, and I’ve done several variations over the years that are pretty fabulous in their own right. I’ve turned so many people in my life onto the whipped feta thing. I almost always serve it at parties, and every time, multiple people ask for the recipe. My sister-in-law and her fiancee are completely obsessed. Good thing it’s an easy one! People really appreciate that. 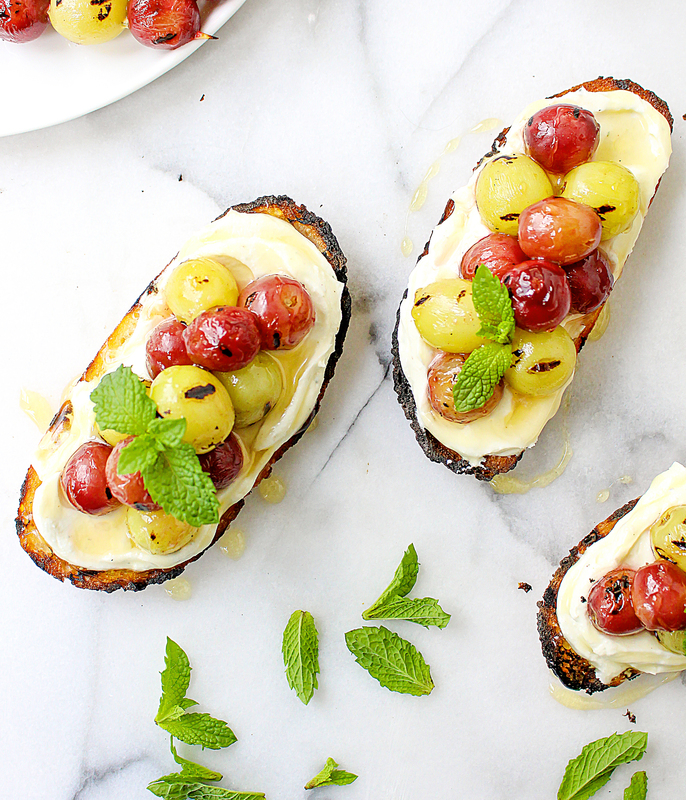 So, with my obsession for grilled bread and whipped cheese, these crostini were kind of a match made in a heaven. I actually came up with this idea back in February. It was freezing out and it had been ages since I had tasted anything smoky/charred from a grill. I started dreaming up all sorts of things to grill as soon as the weather turned, and I couldn’t shake the idea of grilling grapes. I had never tried it before, but I had a feeling that they could only get more delicious once warmed through and softened a bit….and yes, even a bit charred. And ya know what? I was right. 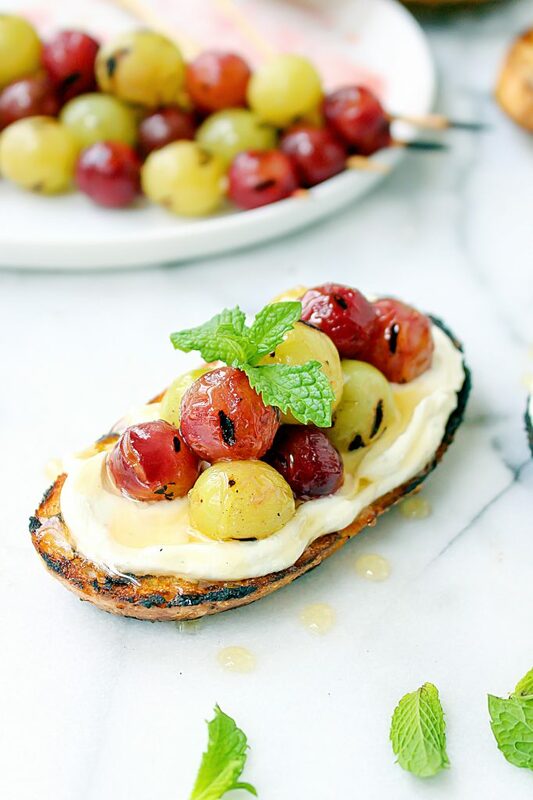 Grilled grapes are my new favorite thing. Right after grilled bread and whipped cheese, that is. Because…priorities. The grapes get even sweeter as their sugars start to caramelize, and the smokiness the grill imparts is FAB-U-LOUS with anything sweet. They are heaven…especially when paired with something salty like the cheese. A seriously delicious combo. 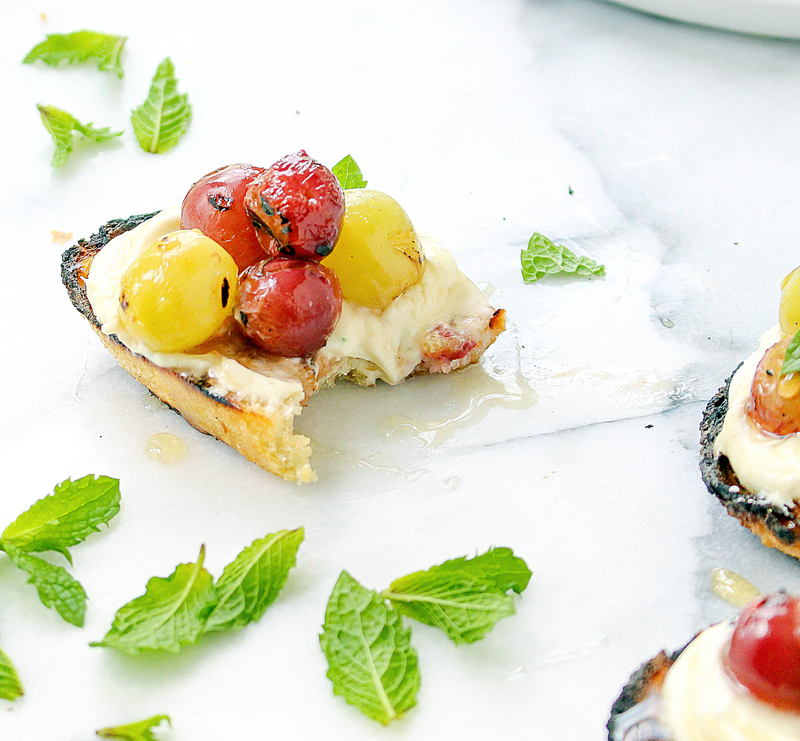 These crostini are such a fun little bite that come together quite easily. 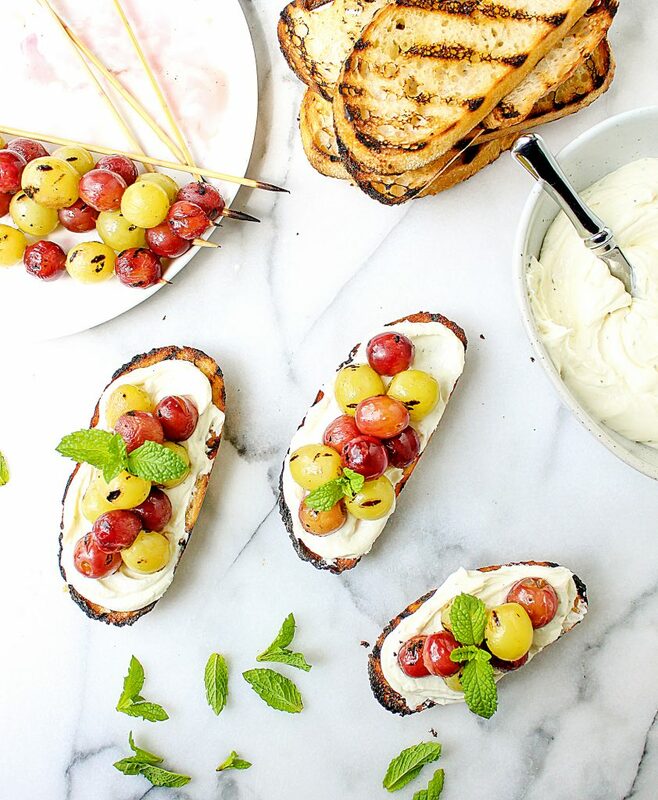 Whip your cheese in the food processor, oil up some bread and grill it up, skewer some grapes and grill them too. 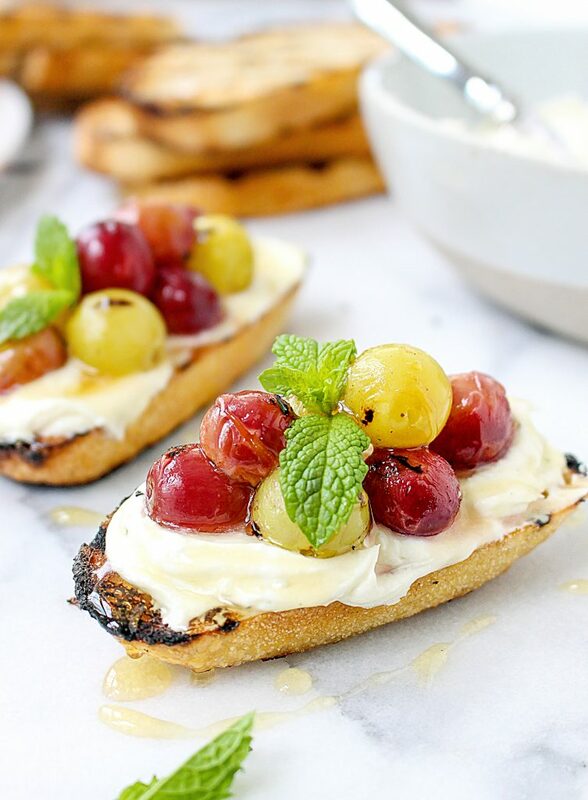 Slather the cheese on the warm bread, top with the grilled grapes, and a healthy drizzle of honey and you’re good to go! I also like the teeniest of pinches of sea salt on my crostini. I think it makes everything pop. Plus, I love the crunch in my teeth of sea salt. It’s the best. I garnished mine with a little fresh mint, but that is totally your call. I thought the situation needed a little green, and I have an OVERFLOWING pot of mint already, so we’re trying to use it up every chance we get. 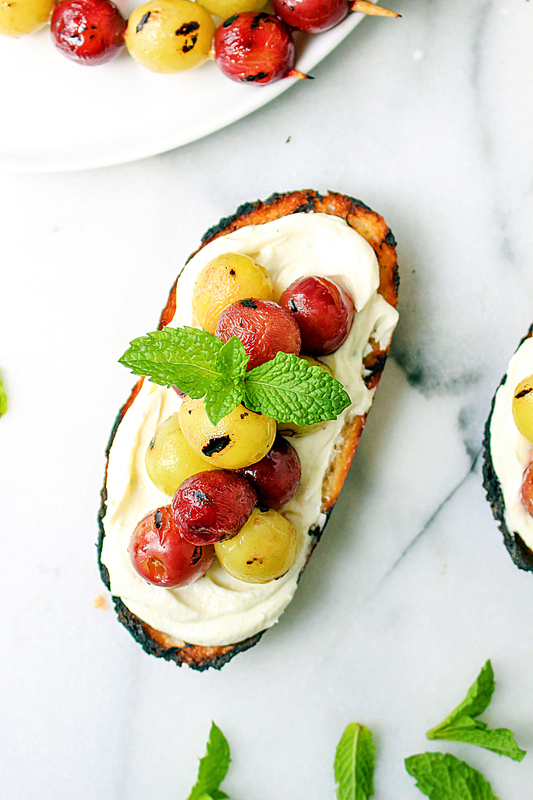 These crostini are totally perfect for a light summer meal (just throw in a lightly dressed mixed green salad) but they’re also impressive enough to serve to guests. They’re fun but elegant. Totally delicious. Plus, aren’t those little grapes just the cutest? I cannot get enough. 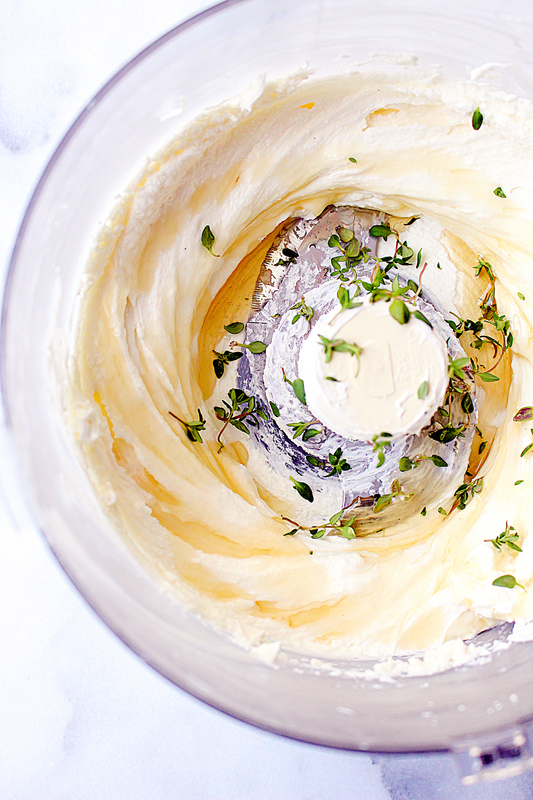 In the bowl of a food processor, pulse together the cream cheese and feta until combined. Run the machine for a couple minutes, or until it is creamy, super smooth, and fluffy. Scrape down the sides of the bowl, drizzle in the honey and the chopped thyme, and then run the machine again to combine the flavors. Season, to taste, with a little salt and more honey, if needed. Transfer to an airtight container and keep in the fridge if making ahead. Allow the feta to sit at room temperature for 15 minutes or so before serving. Preheat a grill or grill pan to high heat. 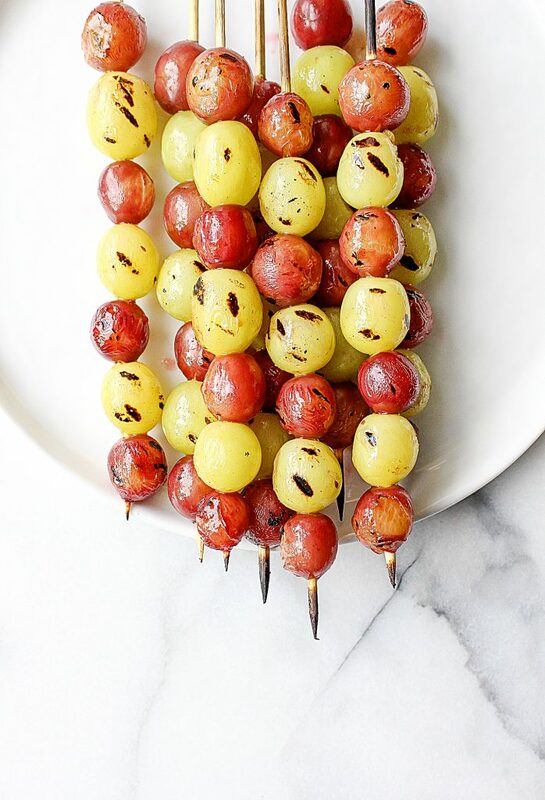 If using wooden skewers for the grapes, soak them in water first for about 15-20 minutes. Spread the sliced bread out on a baking sheet and drizzle both sides with olive oil. Skewer the grapes and add them to the tray with the bread. 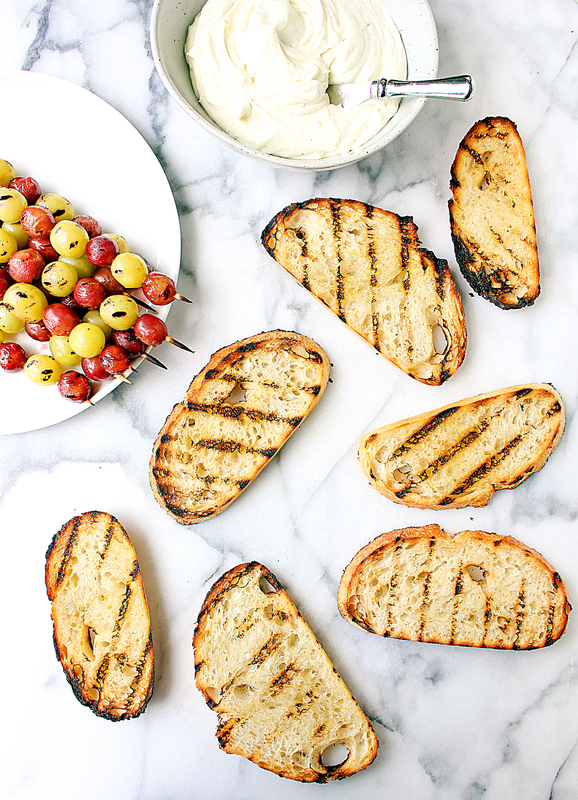 Working in batches, grill both the bread and grapes, turning frequently, until they are golden and charred in spots. You want the grapes to be almost bursting. Allow the grapes to cool for a few minutes and then carefully remove them from the skewers. 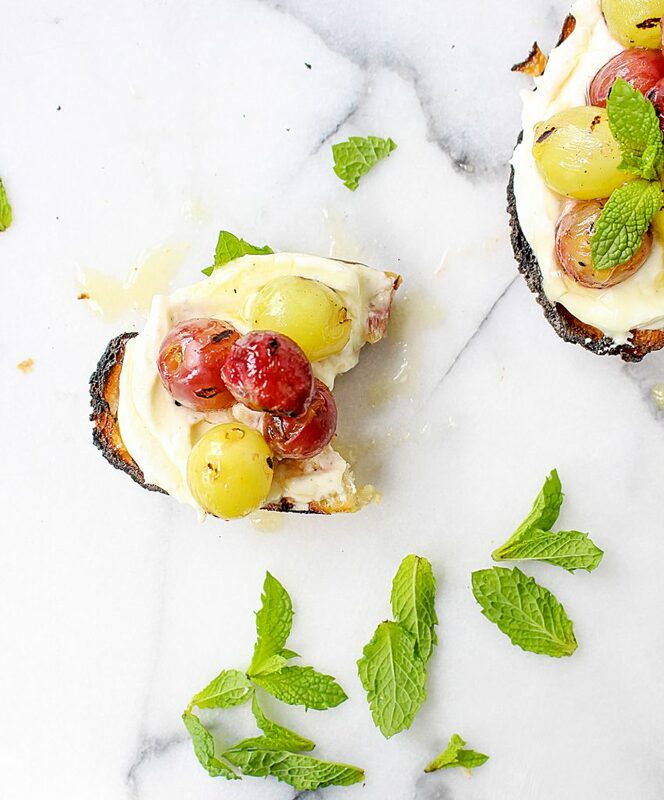 Slather the honeyed feta on the grilled bread and top with the grilled grapes, a drizzle of honey, fresh mint leaves, and a pinch of flaky sea salt. Serve warm or at room temperature. Thanks. I have printed this and intend to cook it tomorrow. Sounds so yummy. This looks like an absolute delight! So delicious!